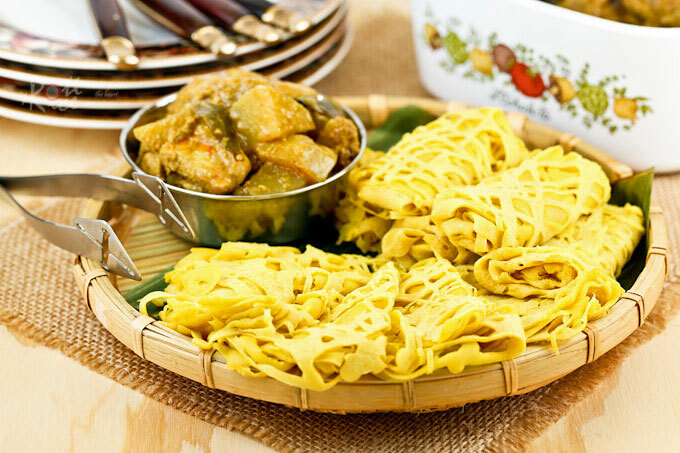 Roti Jala is the lesser known and more elusive cousin of the famed Roti Canai. In Malaysia, you are more likely to eat these net crepes at a social gathering than in a restaurant. It is especially popular during Hari Raya Aidil Fitri (Eid) and traditional kenduri (Malay feast) to mark auspicious events like weddings. Growing up, I looked forward to this treat during Hari Raya. 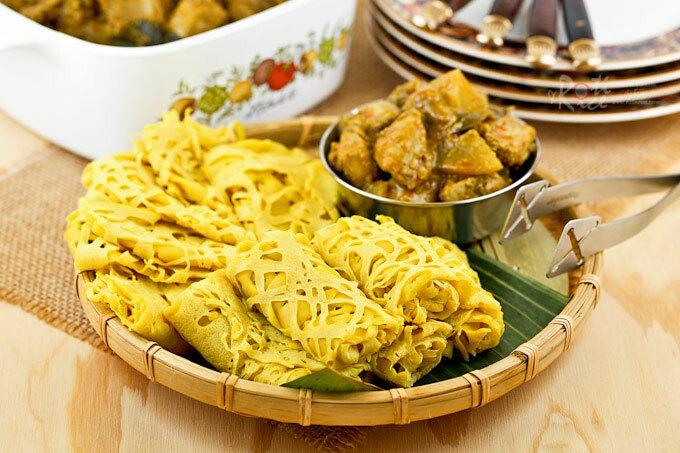 When translated, Roti Jala literally means “net bread” because of its lacy or net-like appearance. Well made Roti Jala is tender and delicate. It should never be brown or crispy. They are usually served with Chicken Curry, Beef Rendang (caramelized beef curry), or serunding daging (spicy beef floss). 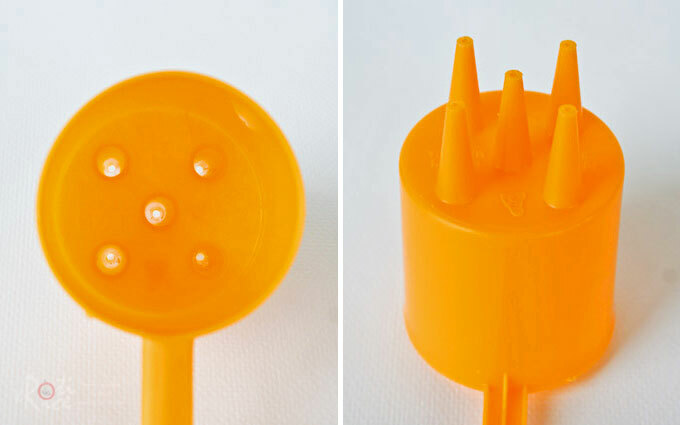 To make Roti Jala, you need a special cup with five nozzles. The batter is poured into the cup and moved in an overlapping circular motion to create the lacy effect. The key here is to move the cup constantly so that you do not end up with a big blob of batter in the pan resembling a regular pancake. It takes a little practice but you should get the hang of it after the first few. If you do not have this special cup, use a squeeze bottle. A Do-It-Yourself alternative is to use an empty milk can punctured with holes. The ground turmeric gives these Roti Jala a nice yellow color and a mild turmeric fragrance. Usually 4 to 5 crepes per person will suffice. This recipe will serve 2 to 3 persons. If a roti jala cup is not available, please use a squeeze bottle or an empty milk can punctured with holes. NOTE: This post was updated on July 18th, 2014 with new pictures and video. I love roti jala especially with chicken curry. Did you make the curry? I just remember I’ve this special cap hiding somewhere in my store room. This is best to serve with curry. I’m like Ann, don’t know where i keep this mould, hehehe..
Don’t you love these! I enjoyed having this with thick curry chicken. Slurpppp…. I love this! 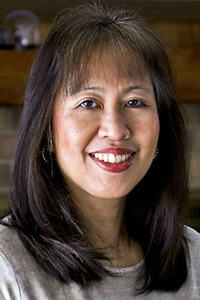 Also thanks for the work around – I saw the cup w/ the nozzles and thought, where on Earth can I get that? 🙂 BTW, yesterday I gave you a “Versatile Blogger” award, just FYI! These crepes will also be delicious with beef stew. I hope you will give it a try. Love the idea of these lacy rotis. They look so delicious. First time I have heard of them. These are lovely- never heard of or have seen them before but I bet they are wonderful with curry. Great tutorial! These look so fun to make. Bet they are as delicious as they look! Looks like a lacy crepes! Must be really good! I have never heard of this dish but egg, coconut milk, and tuemric sounds really interesting combination and I’d love to eat this! Very pretty with lacy design! I always wondered how these were made! They look so elegant. I’ll have to keep them in mind for the next time I make curry. I can’t wait to try them! About time I take mine out from the deep end of the drawer and make this! It has been quite a while since I ate this. I think my kids would be intriqued by the lacy crepes – the trouble is they can eat faster than I can make them…Thanks for the recipe! Have a nice weekend, Biren. I hardly have roti jala while growing up in S’pore. Roti prata is definitely more popular. 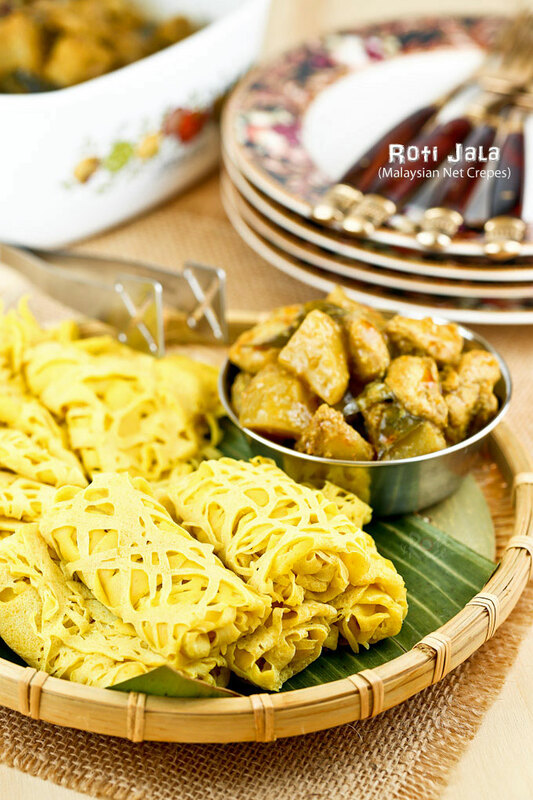 I always wish I could try roti jala, I would love it with any curry! They look so interesting. I remember Kristy making these on her blog. One of our very favourites! Yummy with curry chicken!! Never knew its that easy to prepare roti jala — miss devouring it with hot curry/sambhar and teh tarik! Hey, this is so fun! Never heard of it & the gadget is so cool! Nice treat, Biren! Like that gadget..and would love to try this speciality at home soon..looks so yum! those crepes look superb! So light and fluffy and buttery! Yum! I could eat those both savory and sweet! These look like fun to make not to mention delicious! I’m a huge fan of turmeric and coconut milk so I’m going to have to give these a try. I don’t have the right tool, but I guess I could punch a hole or two in the bottom of the coconut milk can? Can’t wait to make these! Lovely roti gala that will go really yummy with curry! Wild – these sound like they’re similar in concept to the Ethiopian injera? The coconut milk totally has me excited to try them! Roti jala is very easy and quick to make. The texture is smooth, soft, and tender and it can be eaten with curry or serawa (a kind of sweet syrup made with coconut milk and sugar in the southern state of Johor). I personally have never tried it with serawa. What a cool recipe! These crepes look so beautiful and delicate. That five-nozzled thing is very cool.